"A magnificent tapestry. Sanchez forges a new world vision, rich in the cultural and literary intertextuality of Steinbeck and Cervantes." "Dazzling...a comic masterpiece crackling with backhanded wit, bursting with vital characters, its brilliantly contrived plot uncoils with the suspense of a thriller." Thomas Sanchez, author of RABBIT BOSS ("The Indian experience of the last 120 years, a size and scope that is awesome." Los Angeles Times), has created a novel of daring virtuosity and powerful impact. 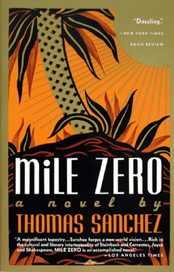 MILE ZERO displays an extraordinary force of vision, heralded in the novel's opening evocation of a space shuttle hurtling toward new frontiers while fearful refugees flee across the Caribbean, bound for haven in the Untied States. "Mile zero" marks the location of Key West--the island that defines the end of the American road, the meeting of the Atlantic with the Gulf of Mexico, the cultural junction where Anglo-Saxon, Latin and African worlds collide. The island is a sanctuary for St. Cloud, an American expatriated in his own country; a passionate activist in the 1960s, he is now a fugitive from the unresolved anguish of his generation, unable to rekindle the ideals of youth. In Key West, St. Cloud crosses path with three people whose paradoxical presence forces him to re-engage with life: Voltaire, a teen-aged Haitian refugee accused of murder; Lila, a secretive young Southern woman desperate to free herself from the spell of the renegade Vietnam vet called MK; and Justo, a Cuban-American cop who understands the island's cruel legacy of slave trade and Latin revolution, and its complex and explosive present, punctuated by marijuana millionaires, threadbare illegal immigrants, proud homosexuals, and hard-luck treasure hunters. Chronicling St. Cloud's dangerous reawakening, MILE ZERO charts an exotic journey through a labyrinthine world of tropical treachery, through displays of amazing courage and integrity. As St. Cloud and Lila slip obsessively into a sensual embrace of redemption, Voltaire plunges into a modern nightmare and Justo becomes ensnared in a "voodoo-Santeria" killing, threatening to undo forever the island's uneasy balance between its pirate past and space-age future. The interlocking lives illuminate the inward and outward tumult of our time, in a huge and profoundly felt novel.